In 1877, Joseph Ray, M.D.–“late professor in Woodward College”–published Ray’s New Practical Arithmetic. I own a copy for some reason, part of a small collection of nineteenth-century books that my father-in-law gave me, containing everything from an abridged version of Livingstone and Stanley to The Early Poems of John Greenleaf Whittier. They’re beautiful artifacts, each disintegrating at its own pace. Both the stock certificate and the bookmark are from the early twentieth century. The former has an empty date field reading “190_”. By Googling “Lexington Cycle Works,” I found a link to the Kentuckiana Digital Library, which holds a scanned page from the March 8, 1906 edition of Clay City Times that refers to G. M. Cox, who apparently sold “all kinds of talking machines” (click on “Page ” under “Contents”; the reference is in the far left column, a little more than halfway down). If you’re not yet convinced of our technological acceleration, consider that it took me five minutes, on the PC in my den, to find scanned source material referencing an obscure business which sold “talking machines” just over a hundred years ago. All this futzing around with history got me thinking about the things that poets choose to include in their work. There was a time, conceivably, when I could have written a poem that mentions talking machines, the National Steel Plate Engraving Company, and Lexington Cycle Works, and they would have been as familiar then as iPhones, Microsoft, and Britney Spears are to readers today. Poets are notorious hoarders. We gather up the world, dropping any and every available object, person, place, or idea into a poem to make it spark. The annihilation of strictures on the use of “low” culture has been one of the most valuable breakthroughs in modern poetry. Now, absolutely anything can go into a poem, and we’re better off for it. One can knock out a poem that includes Payless ShoeSource* or Daffy Duck** and still be artful, dignified, and legitimate. And why not? Pop culture expresses our collective desires, attitudes, perfections, and defects during a given historical moment. If we banish it from poetry, we banish part of ourselves. Unbridled prejudice against pop culture is really a kind of neurosis. But the consequences of incorporating pop references into poetry are generally ignored or oversimplified. Don’t worry, I’m not trying to endorse prissy ideologues who burn their retinas out staring at the sun of “high art.” Rather, I want to approach this topic by thinking about what happens to pop material over time. The notion that allusions to pop culture establish a lasting rapport with readers is a greatly overlooked fallacy, one based on a lack of historical perspective. Pop references prove a poet’s worldliness, securing a kind of street cred, and show that he hasn’t been living in an academic tower. He knows what a Kardashian is! He’s watched every episode of Buffy! He digs Lil Wayne! Stumbling across pop in poetry can be enormously refreshing. Through such references, poets often aspire to a populist art, available to everyone (within the culture). This is another aspect of accessibility, which I took on in a previous post. A deft poet can unpack the relevance of our cultural preoccupations, moving beyond all the flash and chatter to get to something sacred and necessary. Some of the allusions here get away with being both pop and literary (Romeo and Juliet, Morpheus). We also have commercialized meds and Hollywood. Pop references elsewhere in this poem include Nazis, Zapruder films, rockabilly, Hamlet, Cary Grant, Technicolor, James Bond, Q (from the Bond novels and films), O.J. (Simpson), Orson Welles, Rita Hayworth, and KFC. There are also other literary and historical allusions which are outside the boundaries of pop. Hamby’s knowledge base is pretty wide, and I’m not going to question her method. She needs to include all this stuff in order to make this sort of punchy, gabby, and expansive poem. The pop material helps to calibrate the poem’s tone and also gives us some clues about the speaker’s obsessions and the way in which she processes the world. But what’s the pop shelf life of NyQuil, Xanax, and The Matrix? How long will they retain the cachet that sets down inroads to our cultural consciousness? What if she replaced NyQuil with Lloyd Manufacturing Co.’s Cocaine Toothache Drops, or some other nineteenth-century palliative? The truth is that the awareness of shared experience afforded by most pop material is ephemeral, dependent on its existence during a specific historical period. Some pop will be absorbed and carried on–like the works of Shakespeare–but most of it gets drained of its cultural significance. I’ll wager that Xanax will be largely obscure to the general reader five hundred years from now. So what does this mean for the future of Hamby’s poem? All that pop material, once it drifts away from the realm of general knowledge, will be handed over into the keeping of scholars, who will spend as much time footnoting Xanax references as they do allusions to Oedipus Rex. Usage of pop material only guarantees shared points of reference between the poet and contemporary readers, not between the poet and posterity. Poets don’t have to curb their use of pop material, but they shouldn’t fool themselves into believing that dropping the names of trendy movies, music, or medicines creates a consistent rapport with readers over time. In fact, doing so increases the likelihood that their poems will be seen as obscure to future audiences. That’s the pop paradox–more pop material yields both greater accessibility and greater obscurity, relative to a given period in history. 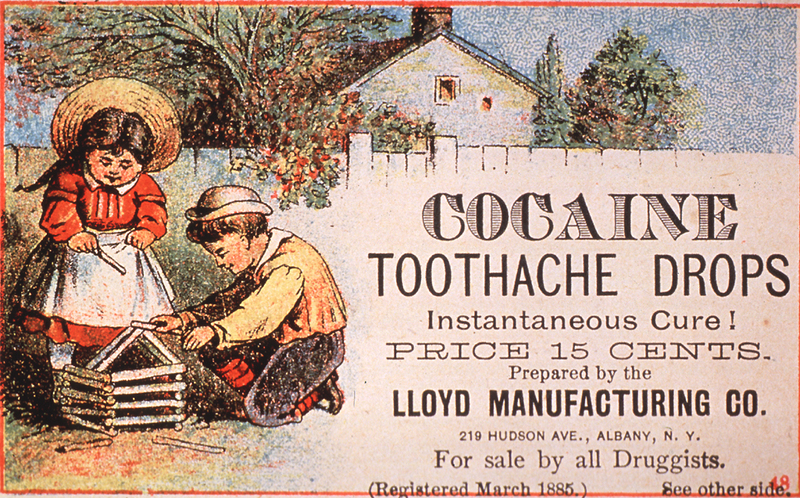 Photo caption: “Cocaine Tooth Drops” courtesy of http://www.nlm.nih.gov/hmd/sowhatsnew/images/1a9-a.jpg. This is Peter’s fifth post for Get Behind the Plough. Peter B. Hyland is the author of the chapbook Elegy to the Idea of a Child (Trilobite Press, 2009). His poems have also appeared in Ploughshares, New England Review, Green Mountains Review, New South, American Literary Review, Ecotone, and elsewhere. His work has been nominated for a Pushcart Prize, and he serves on the advisory board of Glass Mountain, the University of Houston's undergraduate literary journal. He holds a BFA in drawing and painting from the University of North Texas, and an MFA in poetry from the University of Houston Creative Writing Program. He and his wife live in Houston, where he is a director of development at the Menil Collection.